Prism Solar: With the new stress on renewable clean energy, new solar technologies are rising out of the laboratories - and Holographic Tuning (a solar concentrator technology) is an excellent example of some of interesting technologies being developed. Holographic tuning, is a new technology with one goal in mind – less expensive and smaller solar panel collectors. The technology is predicated on a novel speculation in which solar cells are holographically tuned to draw in and focus different spectrums of daylight on solar cells. The cells are tuned to draw in certain spectrums that may be converted without unnecessary heat production. This permits the cells to make the maximum quantity of energy while maintaining a miniscule size. Current silicon cell technology is prohibited to just a couple of spectrums and is highly wasteful as it fails to convert up to 85 % of the daylight into power. To make things even better, the method is being engineered to “tune” the solar light onto both sides of each cell, so doubling the energy output. Through 360-degree collection, HPC solar modules collect more energy over a wider range of angles, for high efficiency throughout the day and year. HPC Film is the core component of Prism Solar’s Holographic Planar Concentrator™ (HPC) technology, which enables solar modules to generate the same yield as conventional modules while using 50-75% less photovoltaic material.Reducing the amount of expensive silicon in a solar module greatly lowers material cost. It also results in manufacturing savings through reduced assembly and processing requirements. HPC Film consists of several gelatin-on-PET plastic layers. Each film is imprinted with a holographic optical element. Together, these elements diffract the wavelengths (400-1100nm) that can be converted to energy by solar cells. 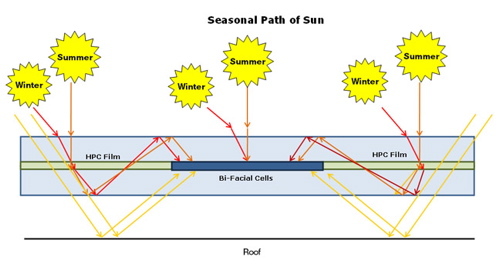 An important point when comparing normal crystalline solar panels and those built using HPC Film, is that the HPC Film keeps solar cells operating at or near their peak performance temperature. Wavelengths of sunlight that cannot be converted by the solar cells are allowed to pass through the film and panel, rather than being absorbed and converted to heat. This "spectral selection" feature keeps cells operating close to their ideal temperature curve without mechanical cooling—even at 3X concentration. Note: HPC Film has been field proven in installations for more than seven years and has shown no significant degradation or loss of performance. The highly stable film improves the efficiency of solar modules based on monocrystalline silicon, thin film, or virtually any PV material. The prototypes are really extraordinarily striking and are a major improvement over current solar cell systems. Prism Solar Technologies is the leading company in the holographic tuning field. The company is a division of Direct World Power, and is pushing the advancement of the technology thru a sole rights license from the Illinois Institute of Technology. 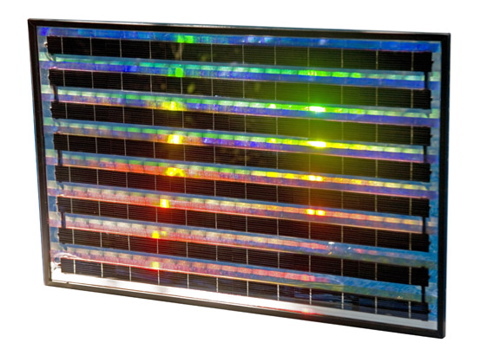 Prism Solar Technologies will begin producing of the new holographic tuning solar cells this year. To see how Prism's holographic film can be used to reduce PV panel production costs while achieving PV panel efficiencies of 20% click here.